Step 1 – Make sure you have saved 1 milk jug and 3 2-liter bottles per person. Wash them all out with soap and let dry. 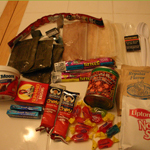 Step 2 – Multiply the number of kits you want by the items listed in the shopping list and purchase the food items from Walmart or your neighborhood grocery store. All the food will cost around $8-10. 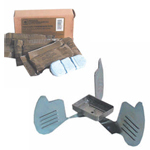 Step 3 – Purchase a small esbit stove and fuel pellets from an emergency preparedness store such as Emergency Essentials or if one isn’t available in your area follow the links below to order online. Only one stove is NECESSARY per family, but they are pretty cheap so if you’d like to have one per kit that is fine too. It will make it much more convenient in a true emergency. 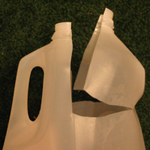 Step 4 – Cut straight down the middle of a milk jug diagonal from the handle. Go about 1/3 of the way down. At the bottom of that cut, make a horizontal slice coming from each side but leave about 2 inches of the jug intact. This should make a sort hatch that you can pull open and insert the items in. Watch our video below if you are having trouble visualizing how to do this. 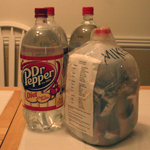 Step 5 – Place the necessary items into each milk jug according to the contents list. Put the Tang and cocoa servings into small zip-lock bags (1/4 c. per serving). If you have extra food left over, stick it in as space permits. Tape the milk jug up. Tape the contents list to the outside of the jug and record today’s date and the family member who will use that kit. VOILA! Step 6 – Fill your 2 liter bottles with water and store all of the items in an easily accessible place (your car trunk is the ideal place if you have room). Check out our Step 2: Water page for more information on how to properly store the water.